Charles has been arguing for a while that the future of the internet is print and I seem to be seeing the word 'transmedia' more often. Theblogpaper fuses online, community and traditional print publishing and is good example of this idea of content flowing across multiple media platforms. 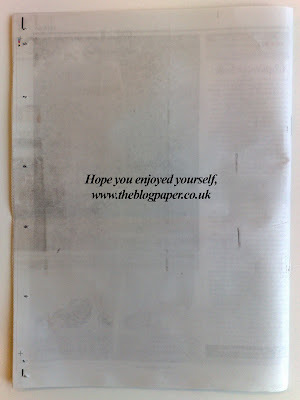 Theblogpaper is the first user generated newspaper in the UK. 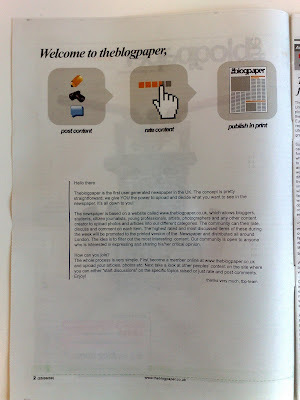 The concept is pretty straightforward; we give YOU the power to upload and decide what you want to see in the newspaper. It's all down to you! 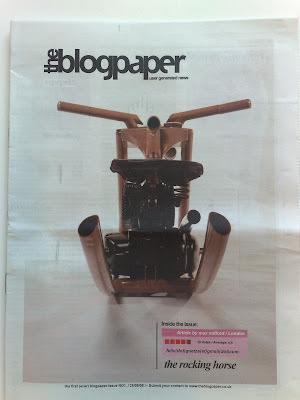 The newspaper is based on a website called www.theblogpaper.co.uk, which allows bloggers, students, citizen journalists, young professionals, artists, photographers and any other content creator to upload photos and articles into our different categories. The online community can then rate, discuss and comment on each item. The highest rated and most discussed items of these during the week will be promoted to the printed version of the newspaper and then distributed all around London. The idea is to filter out the most interesting content. Our community is open to anyone who is interested in expressing and sharing his / her critical opinion. The whole process is very simple. First become a member online at www.theblogpaper.co.uk and upload your articles, photos etc. Next take a look at other people's content on the site where you can either "start discussions" on the specific topics raised or just rate and post comments. Enjoy!" 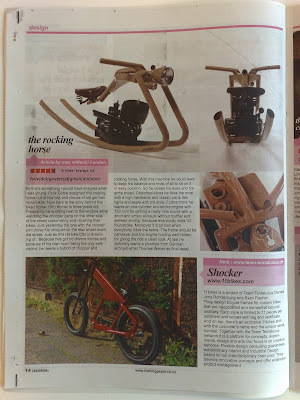 The interesting thing with theblogpaper is that the approach is different to normal newspapers. If theblogpaper can harness The Conversation then people will start to seek out the paper - rather than relying on newsagent distribution or people on the street pushing the product into people's hands, theblogpaper may actually be something people look for. If everyone published discusses theblogpaper on their blogs / Twitter, if people start encouraging friends to vote to help get their articles in print etc then this could be very interesting. I don't think this can work without ad revenue, but if theblogpaper can become an established part of The Conversation then advertisers could be forced to take note.